One or more photo(s) has been virtually staged. This picture-perfect POOL HOME welcomes you to a true oasis with STUNNING GOLF COURSE and WATER VIEWS. Fall in love with the extensive landscaping and trees that wrap this entertainerâs paradise. 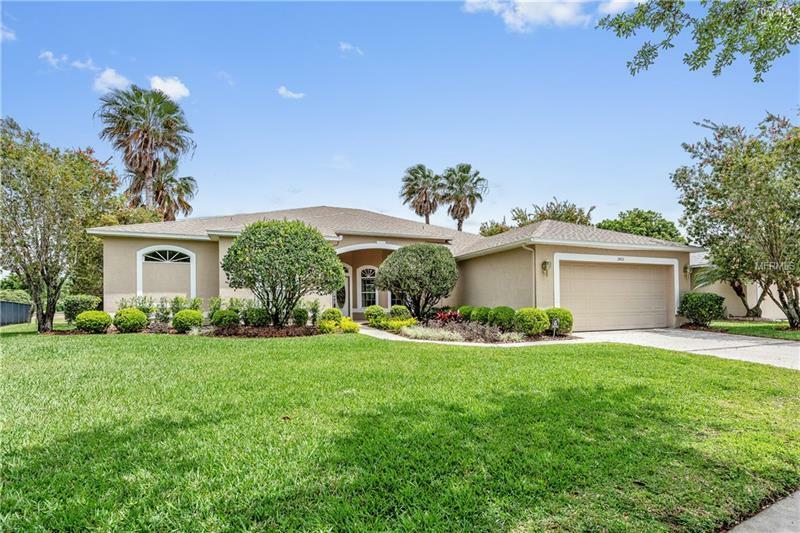 Upon entry of this beautifully maintained home youâll fall in love with the spacious living room & dining room spaces with sliding doors leading to the beautiful lanai. An OPEN FLOOR PLAN awaits showcasing VAULTED CEILINGS, GAS FIREPLACE, BUILT-IN FEATURES, SWEEPING VIEWS, & TILE FLOORS. The RENOVATED KITCHEN is perfect for entertaining with STAINLESS STEEL APPLIANCES, QUARTZ COUNTERTOPS, ABUNDANT STORAGE, & a BREAKFAST BAR. SPLIT BEDROOM PLAN delivers a PRIVATE MASTER RETREAT with access to the SPARKLING POOL plus a MASTER BATH boasting DUAL SINKS, GARDEN TUB, and a separate shower. There is also a separate OFFICE that can be used as a 4TH BEDROOM or anything your heart desires. Gather with guests, enjoy family cookouts, and spend sunny days lounging by the SCREENED-IN POOL in the EXTENSIVE LANAI! The Stoneybrook community offers unparalleled 5-star amenities including three 24-hour guard gated entrances, golf courses, sauna, clubhouse with a resort-style pool, & walking trails. Enjoy tennis lessons, Zumba classes, personal training, Pilates, yoga, USA swimming, and karate classes at the start-of-the-art fitness center. You can also take advantage of the basketball court, soccer & softball fields, playground, and tennis courts. Donât miss out on this move-in ready home â IDEAL for entertaining guests & family! Amenities Additional Fees: Capital Contribution Fee - $1600.